Happy (belated!) New Year everyone. I hope you had a relaxing and enjoyable festive season. I spent a great summer at the beach, spending quality time with my family and catching up with friends. Just what I needed to re-charge the batteries and feel inspired for 2017. I can’t believe we are already half way through February! Over the break I came across this beauty. Every room is so gorgeous, I had to share it with you. It is designed by the talented team at Chango and Co. It is a beach house in the Hamptons (of course!) and I think it is the perfect blend of coastal and Hampton’s styles with a touch of industrial. The entrance features shiplap walls and industrial windows and door. The white palette adds to the light and airy feel. The living room has neutral tones and continues to an outdoor entertaining area. 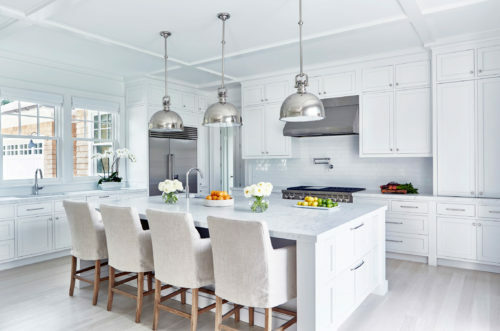 The kitchen is a classic white and features overhead chrome industrial pendants. I love the use of soft sheer curtains in the kitchen, it breaks up the hard surfaces and softens the space. The sitting room includes relaxed slipcover chairs and a cosy open fire. The master bedroom continues the neutral palette with another fireplace. A luxurious bath setting in the ensuite. The kids’ bedroom is a fun space with hanging chairs and anchor wallpaper. Custom made bunk beds with a loft that I’m sure the kids love. One of my favourite rooms would be the guest room. I love the gallery wall and cosy window seat. The mud room has ample space for hanging beach towels and hats. The exterior is equally as impressive. Separate Al Fresco areas for dining…. I hope you enjoyed the tour. Lots of inspiration in this Coastal Dream Home. And on a side note, I have just found out I have been nominated as a finalist in the Australia’s Top 50 Influencer Awards. This blog has been a great way for me to share my love of design and decorating and something I love doing, so I am thrilled to be considered. Winners are announced in March. 3 Responses to "A Coastal Dream Home"
Another great read thanks to you Belinda! I am always amazed at how you are able to write and make your readers feel that they are just talking to a friend. Keep writing please!